I realy need to go to jogya, after 4 year ago. I am looking some batiker from jogya to bring to bali. At this moment i just working with lokal people, been working for 5 years, but they speed skill not fast as jogya batiker. if i am busy suppose you can help me to find some batik worker there for me. Pak Tjok has offered land near a temple in the center of the village for visitors to come and support local programs for reforestation, organic agriculture, education and other community projects. A large focus is growing natural dyes such as indigo for Pak Tjok痴 well-known batik studio where he employs several villagers to make beautiful batiks with these all natural dyes. They are currently seeking funds to finish a building that will house a library, computer, and rooms for visitors who can teach english or other skills as they learn about batik and help with the other projects. 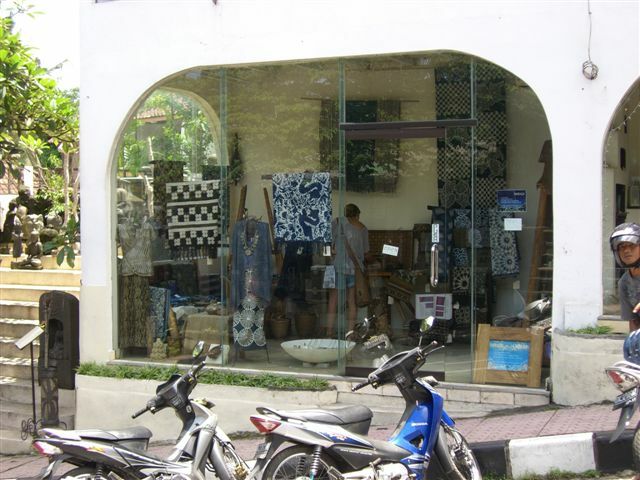 Although Bali has no batik tradition, batik has been made there for the tourist trade for a number of years. Primarily intended as beachwear for tourists, most of this batik is not particularly noteworthy except for its colors that are often quite jarring. Tjok Agung Pemayun is producing batik of a markedly higher quality than the norm at his workshop in Pejeng. He is from the royal family of Pejeng and produces an array of batiks for clothing and display mainly using handspun cotton thread from Tuban in eastern Java and indigo dye, but also sometimes with other natural dyes as well. The patterns on his batik textiles tend to be fairly traditional in a generic sense, but at the same time reflect experimentation in terms of overall layout and motif designs.